In my last post I wrote about how I dropped 70 lbs. to achieve a long-term healthy lifestyle. Last month I wrote about—and defended—those who choose to follow less healthy lifestyles. On the surface these two posts may seem at odds with each other. Let's see if I can square that circle. Let's start by looking past the surface of my last post. A quick read might make that article look like a vain self congratulatory promo for health consciousness. In reality, I was writing about ways to achieve goals that are important to you by highlighting my successes in accomplishing objectives that have been important to me. The principles I outlined can be applied to your own ambitions, whatever they may be. The beautiful thing is that your aspirations don't have to look anything like mine. I know and love a couple of people who like to show their care for others by introducing them to things that they like themselves. The underlying belief is that if they like something, everyone else must like it too. It seems to blow their minds when someone is less enthusiastic about something than they are. 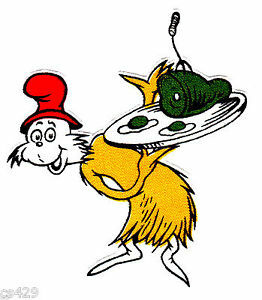 Like Dr. Seuss's Sam-I-Am from Green Eggs and Ham, when these folks encounter someone who doesn't care for something they savor, they are certain that dogged (often annoying) persistence is the appropriate response. Those with authoritarian leanings have no problem also considering coercive measures. But unlike Seuss's Joey who ultimately discovers his enjoyment of green eggs and ham, people in real life often do not come to love things that they are pestered about trying. People have diverse preferences, and with the exception of the political realm and sports fandom, that's usually just fine. So it is in this case. You do not have to be fanatically invested in the worship of carnal fitness to find some benefit in positively changing something about yourself by positively changing your internal picture of yourself. I fully agree that physical fitness isn't the be all and end all of human happiness. Nor is longevity, as I reminded each time I visit my mom's elder care facility. What is something you want to change about yourself? Go back and read my March 14 post to see if there are any principles there that might be beneficial to you. Now, it's entirely possible that the affirmation approach I mentioned in that blog post is nothing more than self delusion. It might include confirmation bias that gets adherents to ignore system failures while paying outsize attention to coincidental successes, much as gambling works for habitual gamblers. Naysayers note that there are no studies that back up the claims of affirmationists; just testimonials, as is often the case with herbal supplements. Dilbert creator Scott Adams once agreed that his brand of affirmation is probably just a form of self hypnosis. But he then noted that the happiness and satisfaction his affirmations have brought him are real enough to keep him doing it. Why should he care if the results might not be scientifically validated when his life is happier? #1 New York Times best-selling author Pam Grout has also successfully employed affirmations. In this July 2016 blog post she writes about Adams' approach to affirmations. She notes that Adams started out being skeptical about affirmations but figured the cost was low enough that he would try it out, only to encounter success after success. A date with a dream girl, investment success with no experience, scoring exceptionally high on the GMAT with no preparation, etc. In his book How to Fail at Almost Everything and Still Win Big, Adams explains how he recovered from the rare (and thought to be incurable) disease of spasmodic dysphonia by using an affirmation. It's worth reading the book to get this story. In fact, Adams cleverly scatters the story throughout the book, leaving a tantalizing trail that requires you to read the whole book to get the full tale. In the end, Adams confesses that a dispassionate observer might conclude that his affirmation played little discernible role in discovering the expensive and unusual treatment that led to his recovery. But in Adams' mind the series of events that led to this result would not have happened without his affirmation. I have likewise used affirmations to good effect and I'm far from the only one. This cold thinking atheist says that affirmations helped him triple his income over a four-month period. Writing about the "astonishing" coincidences, he says, "I think that when you write a goal every day 15 times, your brain starts paying attention to the opportunities around you." Can affirmations work to help you achieve your goals? There's only one way to find out. Give it a shot. The cost of doing affirmations is pretty meager. You have very little to lose and much to gain. Try it out. Post your results.